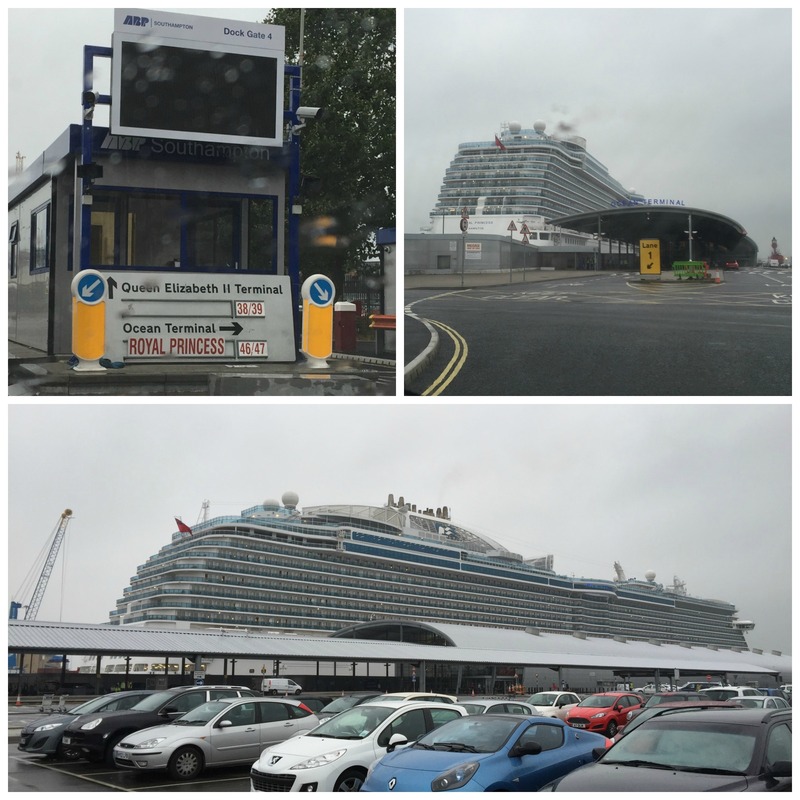 Have you heard of The Royal Princess Cruise Ship, one of the amazing ships of The Princess Cruise Line? 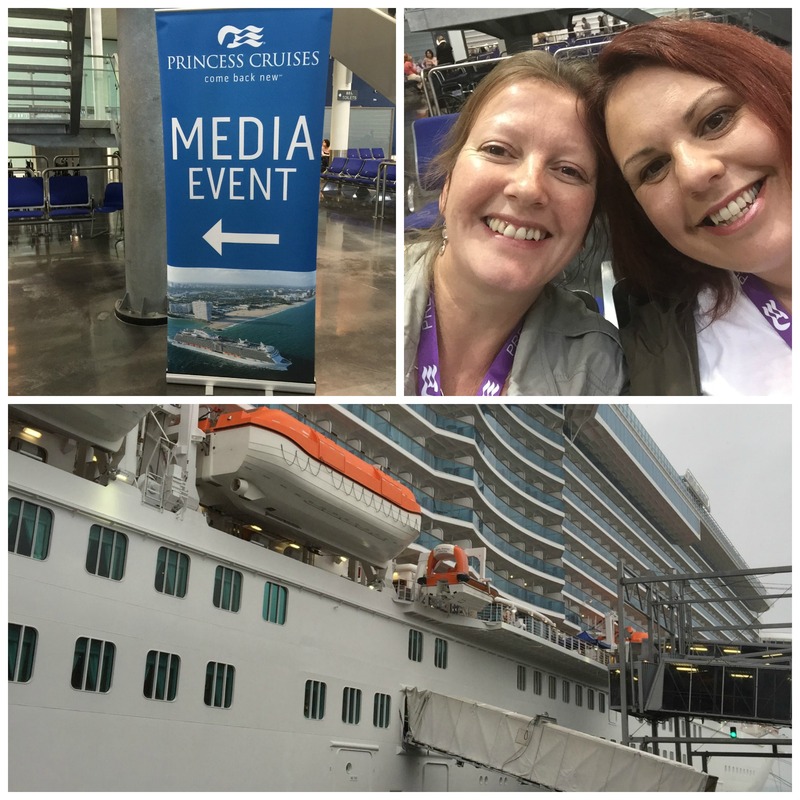 Mummy was lucky enough to be invited to a book launch on board in the summer, whilst The Royal Princess was in Southampton Docks. 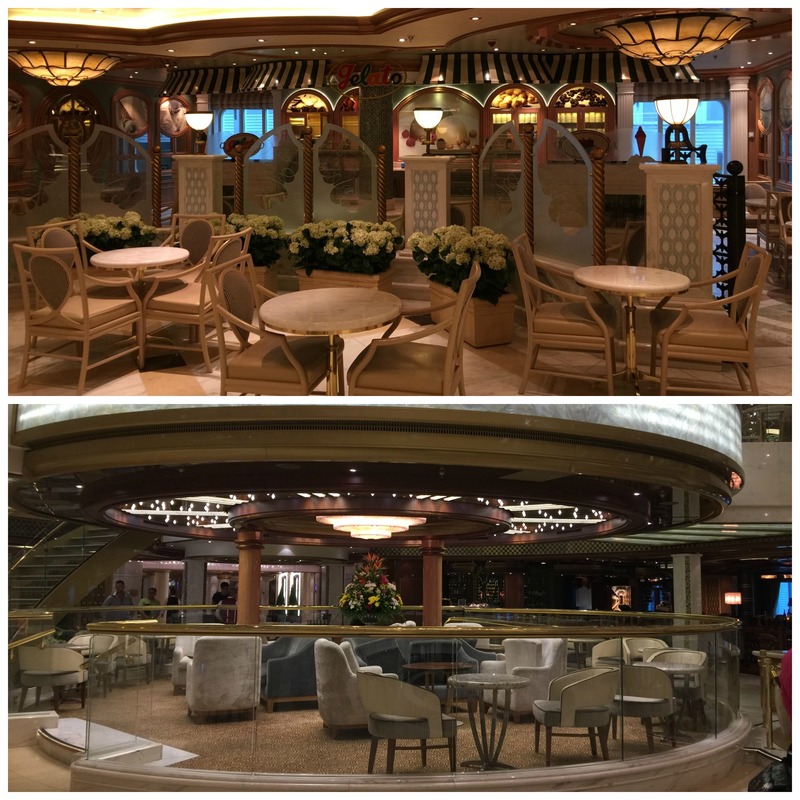 “I have cruised with P&O and Royal Caribbean cruise lines before, but never been on a Princess ship and I was looking forward very much to seeing what it was like. I was also looking forward to the book launch of Chrissie Manby’s latest book, I am covering this event in a separate post. I met my blog bestie Zena at Newbury Services and we drove to Southampton together. As we approached the docks and I caught my first glimpse of the ship I had a huge surge of excitement – it looked incredible and every bit as impressive as the other cruise ships I have been on. We were met by the fantastic PR Team of Princess Cruises and led on board. We went via the crew entrance, and were given a press / visitor badge – I was super excited. 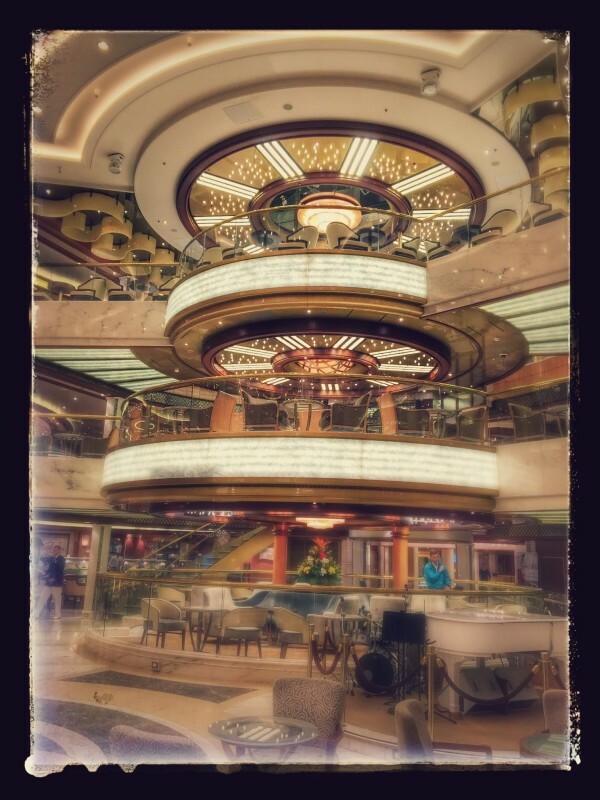 We were put into groups to be shown around the ship, and we went first into the Royal Princess Atrium. It was breathtaking – seriously, absolutely stunning. I cannot use enough superlatives to explain how beautiful it was! We all just stood for a moment taking it in, before trying our best to capture it in photographs! Around this main area there are several things you can do including trying Italian Ice Cream in the Italian Gelato, or have a tasty bite in the Ocean Terrace Seafood Bar. You can also enjoy Piazza entertainment with a martini in Crooner’s, or a Bellini in Bellii’s Bar, or just sit here and relax. It really is a stunning space to spend time in. 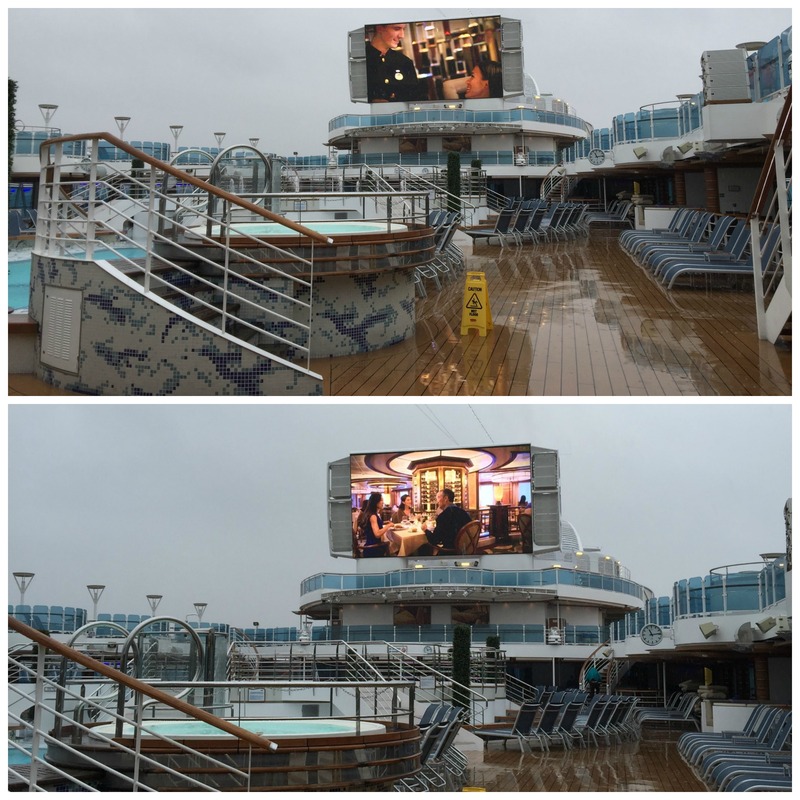 We were then taken up to the top deck where there is the main Fountain Pool – the day I visited it was pouring with rain so unfortunately we couldn’t go out on the main deck. There are various eating options available near the pool, including a Pizzeria and Grill with undercover seating where you can shelter from the hot sun – or in our case, the rain! The fantastic Horizon Court, Horizon Bistro and The Pastry Shop are on this deck too. On this deck there is the innovative Princess® WaterColor Fantasy where in the evening, these top deck pools transform into an amazing interactive sound and light show where dancing fountains shoot water up to 33 feet. A first at sea on this ship is the Sea Walk, where you walk along a glass panelled walk way that extends 28 feet beyond the edge of the ship, giving a unique view of the sea and deck below. Not for the faint hearted! You can also watch movies on this deck under the night sky on a huge screen – the first cruise line to introduce this – you can even enjoy complimentary popcorn whilst you watch the film, or enjoy a glass of bubbly in the hot tub! We saw a demo of the screen and I was super impressed by the quality of the picture. The hot tub looked so great that I am really thinking of getting an inflatable hot tub for the family. The Princess Theatre is Princess Cruises biggest yet and is a spacious, luxurious theatre where you can watch the ships entertainment. 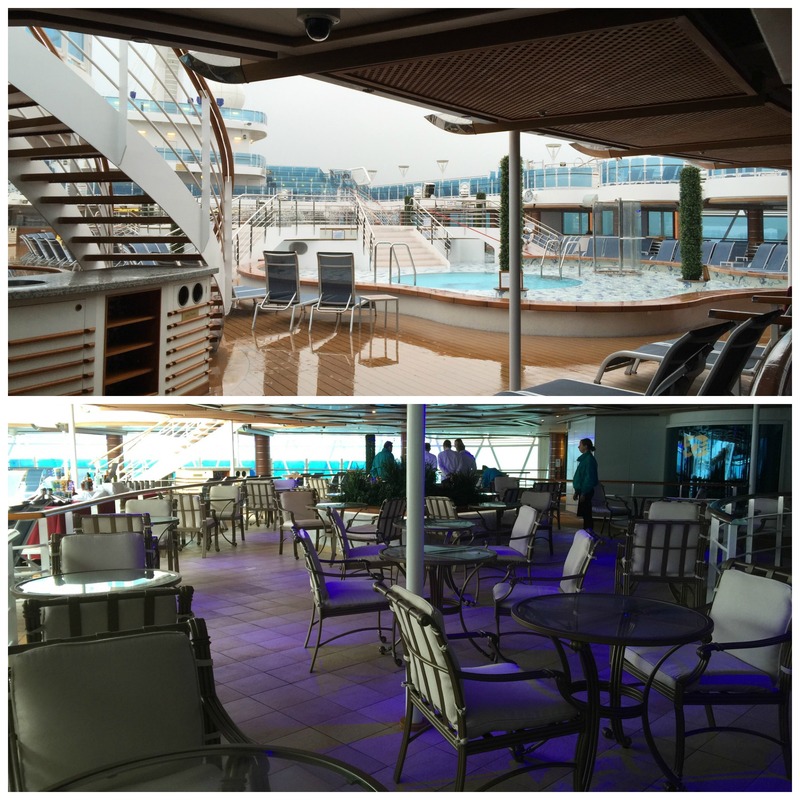 There is so much to this ship that I will talk about the food and dining, and the Youth and Teen Centres and facilities for under 18’s in another post! I have to say that the Princess Cruises website has detailed, in depth information of The Royal Princess Cruise Ship, and their other ships with 360° virtual tours, deck plans and live Bridge Cams too. I haven’t been on a cruise in about 10 years. I am sooooo overdue to go on another one. We are going on a Royal Princess cruise in December! We love Princess cruises. Wow this ship sounds amazing. I can’t wait to hear more about it. I’ve always wanted to try out a cruise. Looks fabulous, there really are no limits to the entertainment and facilities now available on cruise ships. I am very excited as I booked my first cruise last week! Wow, cruisw ships are so impressive. I also love Chrissie Manby! The Matchbreaker is one of my favourite chick lits! Wow this looks amazing! 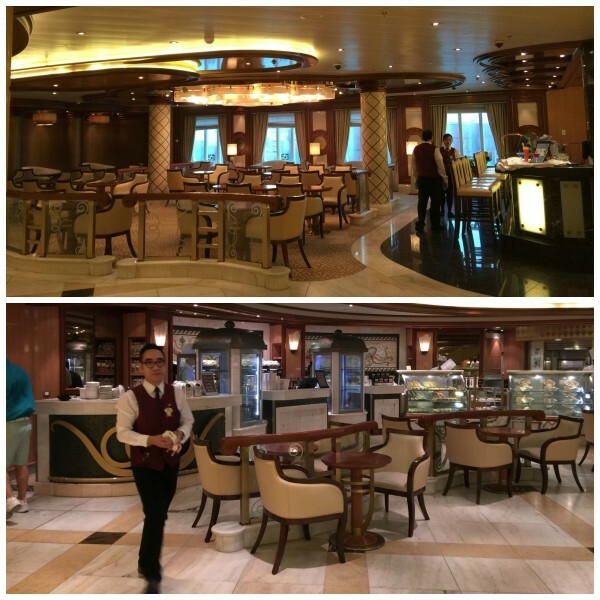 I’ve never been on a cruise ship – This looks like something from a film! Shame it was rainy but wow that ship is truly incredible inside!! I had no idea cruise ships were that fancy! I have never been on a cruise and it’s on my bucket list! That is one impressive looking ship! Lorraine recently posted…Blogtober challenge!!! Here’s DAY ONE!!! I’ve never been on a cruise but really want to – this one looks amazing!! Wow the inside looks incredible even without the hot tub glass of bubbly thrown in! That’s such a beautiful cruise ship! Princess Cruises is really one of the best! I love their theater the most. Oh my goodness, lucky you for getting to go on board such a fabulous looking cruise ship! Lovely photos and round up of your super day. Oh my goodness. Everything inside looks amazing. I would love to go on a cruise someday. oh this brings back memories of my honeymoon we went on the royal Caribbean experience this ship has lots of similarities. 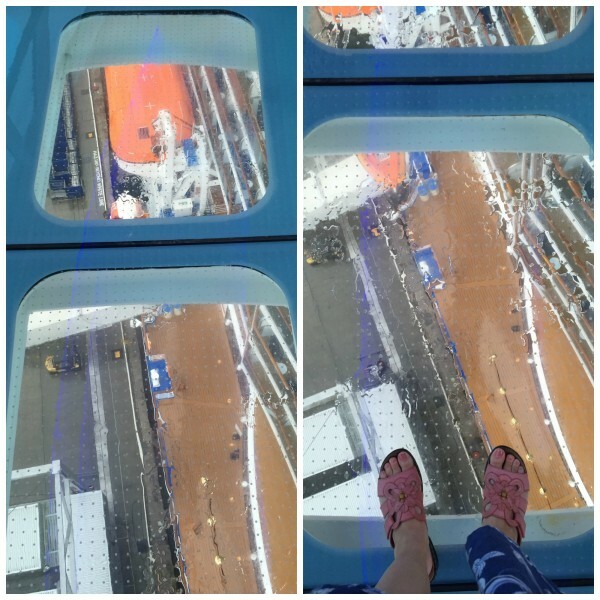 There isn’t a chance you’d get me on that glass floor thing oh no! Wow, just gorgeous! One day I’m going to get on a cruise and relax, lol. I’ve never been on a cruise, but it’s for sure a goal of mine. I’m definitely going to look into Royal Princess Cruises more. Thanks for sharing! Amber Faith recently posted…Why I Recommend Bibbidi Bobbidi Boutique at Walt Disney World! We went on a cruise for our honeymoon and it was amazing! I don’t think we’ll be able to afford it again for a very long time though! Yes! I have been on a couple of P&O cruises before (as a kid) and one on the QE2. You’ve reminded me just how spectacular the ships really are. It looks fabulous … and now I want to go on a cruise!! Emily recently posted…Frozen 6-in-1 Game Review and Competition! Jenni – Odd Socks and Lollipops recently posted…Am I good enough? It looks like an amazing ship. The size of that theatre is huge. I’ve never cruised before but I would like to try it. Oh wow, look how lovely the ship looks! I’d love to go on a cruise one day. Or even just step on board to have a look round!! 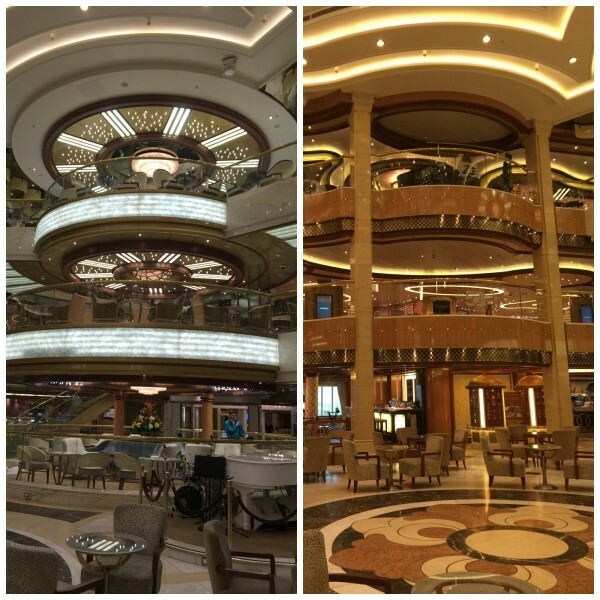 The photos are amazing, Cruises always look so luxurious! I’ve always been really undecided on cruise ships but you make it look so great! I have never been on a cruise but my church does one every year and every year I promise myself that I will go. I’d love to take a cruise. This looks great, I especially like those stairs. I’ve been on a few cruises and I think they are like no other holiday. They are so spectacular and you get such an experience. This one looks beautiful. I once walked over the glass bottom on the Eiffel Tower, and I cried so the Sea Walk would definitely not be for me! The cruise ship looks better than some of the hotels I have stayed in it is beautiful especially the marble decor and the gilded cascading stairs. My goodness! What a beautiful ship. A cruise is at the top of my bucket list – Such a same the weather was so glum but you still managed to capture how glam it looks. Wow! This looks absolutely amazing. The gelato place swings it for me 😉 I’ve never been on a cruise, but I’m definitely tempted now. 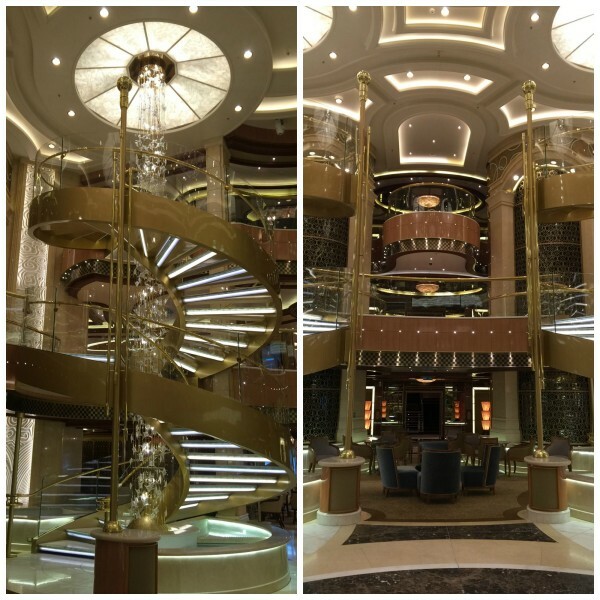 wow the ship is absolutely stunning inside – looks very elegant. I definitely need to add a cruise to my listing. It looks like such an awesome time.